I'm stuck in traffic when I could be on Megabus and surfing the internet. Darn. When I brought my daughter home from college this was the scene before me. Traffic was stoped; then stop and go for miles. I was surprised to look up and see the bus. Megabus has made a few changes on their route from Knoxville to Washington, D.C. The bus stop is the same but the time of departure isn't. Riders can now catch the bus in the morning or evening at 10:30 am or 10:30 pm. It still takes about 9.5 hours to get to Wasthington, D.C. from Knoxville on Megabus. Another change is that the rest stops are now different. A recent rider told shared that the night stop is now at a Wal-Mart shopping center. She tells us that there are restaurants on the lot and that riders on the Megabus from Knoxville to D.C. route can go into the Wal-Mart. So far this information is unverified but this rider has been accurate before. Another change on the Megabus from Knoxville to Washington, D.C. route is the break stop. 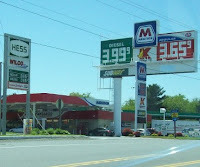 I saw the bus pull off on a service road a few miles before making the Christiansburg, VA stop. Megabus actually pulled in right behind me when I stopped for gas and lunch. I had to laugh at the irony. 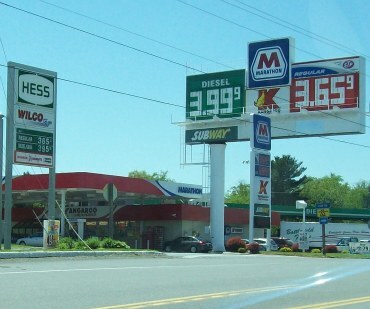 The service road has a Denny's restaurant, Burger King, Truck Stop and at least one other convenience store. Megabus on the route from Knoxville to D.C. appeared to be about 30-40 minutes long. I pulled out just as the bus was loading. It is important to note that all Megabus stops can and are updated without notice. This blogger plans to do some traveling on Megabus from Knoxville to DC and beyond later this summer. More information will be coming then. Is there anything about a Megabus route that you'd like to share? Why not leave your thoughts in the comments section below? It's a good way to let others know. I only wish the bus didn't leave DC at 11:00pm now. 11:00 is ok for a regular city, but DC shuts down at 9:00, and it leaves from a parking lot in the middle of nowhere.